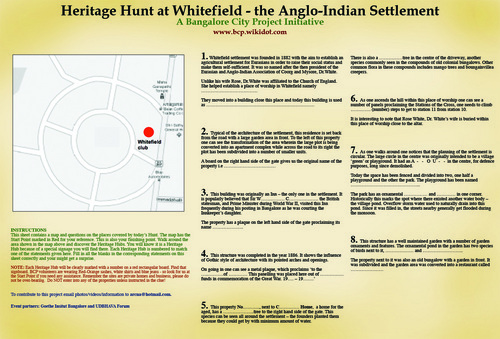 As part of world heritage day celebrations we organised a heritage hunt in Whitefield. 7 teams (15 people in all) participated. We adopted a slightly different model from that at Malleswaram and Gavipuram. Here participants were given a map, which carried no text and just showed the limit of the streets they had to walk in their quest for heritage hunt stickers. These stickers on certain properties each carried a number corresponding to a numbered clue. Participants had to solve the clue by observing the structure, which carried the same number. We offered three prizes – a meal at Herbs & Spices (a restaurant in Whitefield set in a restored colonial bungalow and grounds) and traditional game boards by INTACH Bangalore. Other participants got small mementoes from the Crafts Council Shop Kamalini. The event went off well with active support from Whitefield residents just like last year when we conducted an urban space event in the area. Most participants started before 3:30 and were able to complete the hunt by 5:00. None of them managed to get all the answers right but they really liked the idea of wandering around and exploring a place by themselves as they could do it at their own pace and stop of where they liked unlike a guided tour. All of them were unaware that a historic settlement existed at the spot even though they lived and or worked in the area and were appreciative of the effort put in. The event was rather under attended but participants expressed a wish to take part in the other hunts as well. So guess we ended up splitting our target audience. However our principal aim was to create a buzz and guess we succeeded to a certain extent given the pretty good press coverage - The Hindu, Times of India, DNA (they carried features on the 17th, 18th and 19th). It would be good to think about handing over the responsibility of organising future hunts in the area to Whitefield residents and a follow up to the buzz generated. Organiser: UDBHAVA and Archana Prasad.